Most people try too hard when attempting to turn a horse. You should not lean into the turn as if you were trying to turn a bicycle. Nor should you pull the reins either back — the horse might break his gait or even stop — or too far to the side. Leaning will throw the horse off balance and probably confuse him. If you pull the reins too far — say to the right — you will end up turning your horse's nose in the other direction. You can imagine how that might confuse him. The simplest way to get a turn to the right is to bring your left leg back about one or two inches, keeping your heel down. Then, rotate your upper body — from the hips up — to the right. Let your hand — or hands — move with your body. Let your head, also, move with your body. Your eyes should determine how sharply you turn. Look at a point approximately one–sixth of the circumference ahead on an imaginary circle painted on the ground. On a larger circle, your body will not turn as much as on a smaller circle. Some people say you should always look between the horse's ears. If the horse is bent correctly around your inside leg, this would probably be about right. If you rotate your body at the hips, the horse will feel a number of different things. The weight of your inside seat bone will increase slightly, and the inside of your outside thigh will put a slight pressure against the side of the horse. Don't consciously apply either of these; just let them happen. As your arms and hands move with your body, the outside rein will touch the side of your horse's neck — neck reining. In most cases, this simple maneuver should bring about the turn. If it does not, you might try rubbing the outside rein slightly on your horse's neck to re–enforce the feeling. You can, also, slightly increase the pressure of your outside calf behind the girth. Without leaning, you may also apply a little extra pressure to the inside stirrup by keeping the your heal down and flexing your ankle. As a last resort, use a little pressure on the inside rein by pivoting your lower arm outward from your elbow. If you apply pressure with one rein you should release an equal amount of pressure with the other rein. Be sure to release any pressure caused by the inside rein as soon as your horse turns his head the least amount. Use the rein to indicate your intent to the horse. Don't try to drag him around the turn. The more you practice this technique, the better reaction you should get from your horse. Eventually, it will seem that the horse is simply going where you look. Actually, you will be giving almost imperceptible cues as you look where you want to be. Perhaps I should point out that, when cantering, the horse's hip — and therefore the rider's hip — on the lead side is further forward in relation to the horse's center line than the hip on the other side. This does not negate the idea of the rider rotating his upper body in the direction of the turn. The rider's hips and shoulders will not, however, be aligned as closely. Even in the walk and trot, the rider's shoulders and hips are not perfectly aligned when turning, but I hesitate to mention this since most riders tend to turn their shoulders too much anyway. If I tell the rider to rotate at the hips, the rider tends not to turn the shoulders as severely. In the haunches pivot or turn on the haunches, the horse revolves laterally around its inside foot — the foot on the side toward which the horse's body is moving. In the haunches pivot, this inside foot remain relatively planted. In the turn on the haunches, the horse should continue in the same gait and rhythm of movement it was using while going forward. The inside foot rises and falls in the same relative position while the other feet revolve around it. The turn on the haunches requires much more precise movements on the part of both rider and horse. The better the rider is balanced and the more he is relaxed, the easier he can influence his horse's movements. The exact actions the rider employs will vary with the particular horse and the circumstances. Some experimentation may be necessary. In general, the horse's body is bent slightly in the direction of the movement. The rider shifts a little bit more weight to his inside seat bone while rotating his body around this point. His outside leg applies more pressure, while the inside leg relieves pressure. The inside rein provides guidance, while the outside rein helps prevent forward movement at the same time it applies some pressure to the outside of the horse's neck. The horse's inside front foot should step to the side and back. The two outside feet should cross in front of the inside feet. The better the horse is prepared beforehand through exercises to develop strength and suppleness, the better the horse will be able to perform this movement. The better the horse is able to re–balance and shift more of its weight rearward, the better it will be able to perform this movement. Precision should take precedence over speed. Many riders try to get their horse's to spin quickly around their horse's planted rear foot. The result is often a degradation of the horse's movement. The forehand pivot and turn on the forehand differ in the same way as the haunches pivot and turn on the haunches. In the first, the horse's one foot remains basically stationary. In the second, it rises and falls in its regular rhythm while remaining basically in the same spot. A variant of these movements is often asked for by trainers doing groundwork. When doing this ground exercise, most trainers pay little attention to the front end, however. The main concern of the trainer is for the horse to move its hind end away from pressure. While getting a horse to move its hind end away from pressure is the main use of the turn on the forehand, it is best to employ other techniques as well when performing this movement while in the saddle. 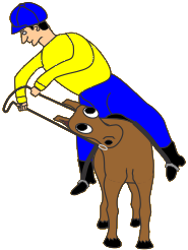 The rider generally asks the horse to bend slightly on the side away from the direction of movement. He, then, shifts a little of his weight toward the outside shoulder — the one on the convex side of the horse. The amount of weight will vary depending on whether the rider wants a forehand pivot or a turn on the forehand. The rider moves his inside leg back slightly and applies pressure either continuously or in a pulsing motion to encourage movement of the hind end. While some riders vigorously apply the spur, a relaxed and responsive horse should respond to slight pressure of the rear portion of the inside of the rider's lower leg. The rider may assist his horse in understanding what is desired by relieving any pressure being applied by the outside leg. The section on "opening the door" provides more information about this use of the leg. Some riders discourage the practice of the turn on the forehand because it requires the horse to put more of its weight on the forehand while we generally want the horse to shift its center of gravity to the rear to help lighten the forehand. For these riders, the leg–yield as described in the section on lateral movements provides a better alternative for teaching the horse to move its haunches away from pressure.